You know Dasher and Dancer and Prancer and Vixen, Comet and Cupid and Donner and Blitzen, but do you recall – the most famous reindeer of all? 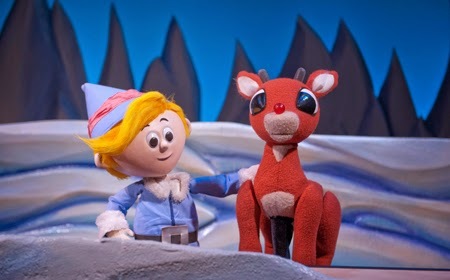 Celebrate the season with the return of a holiday tradition, Rudolph the Red-Nosed ReindeerTM at Center for Puppetry Arts, November 13-December 28. Directed by Jon Ludwig and based on the beloved 1964 stop-motion animated special, the festive family classic rings in the most wonderful time of the year with an unforgettable holiday adventure! New this year, the production will tie in with the national #ShineBright social media campaign, which is a celebration of uniqueness. Led by PACER’s National Bullying Prevention Center, the campaign unites the Center for Puppetry Arts with other nationwide partners, who are using the Rudolph story as a platform for teaching important lessons about diversity and tolerance. Rudolph the Red-Nosed Reindeer is recommended for ages four and up and will be performed in the Mainstage Theater, November 13- December 28. Half-price previews will be offered November 11-12, 10 a.m. & 11:30 a.m.
Tickets include Museum admission and entrance to the Create-A-Puppet Workshop (or To-Go Kit), where children can create their own King Moonracer rod and string puppet to take home for the holidays. Tickets are $9.25-$13.25 (members) / $16.50-$20.50 (nonmembers) and can be purchased online atwww.puppet.org or by calling the ticket sales office at 404-873-3391.